Welcome to my Christmas themed acrylic album class. For my class I decided to take a very basic approach for all of you out there who have never done an acrylic album before. I will show you an easy way to cover up all of your glue so that nothing shows through on the back sides. If you bought the album I'm using for this class then there is no plastic covering to peel off from the acrylic pages. If you are using a different album then make sure you peel off all the plastic before starting. Because I am hiding all of my glue on this album I used my Ad Tech glue runner, but any kind of tape runner or glue dots will work fine. Here's is a photo of my finished album. I went with a Christmas Tradition theme but you can use any Christmas theme you want. 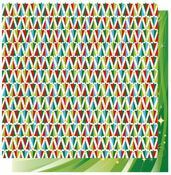 Start by cutting a 5 3/4" x 6" piece from the Let It Glow Glitter paper. Cut it from the corner that has the red ornaments. Center the paper on the front cover and glue down. Next I added my title letters and date. You can use any letters you want to on this. I used two different fonts of Doodlebug letters stickers and some Making Memories tiny alpha stickers for my title. 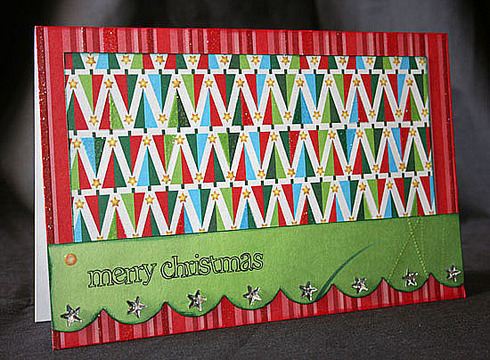 Cut a 5 3/4" x 6" piece from the Merry Wishes paper and glue it down lining it up with the back side on the front cover. 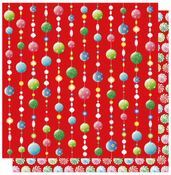 Then cut a 1 1/2" x 6" piece from the Red Christmas Stripes Glitter paper. You can either punch or trace and cut scallops down one of the 6" long sides. Glue it down on the right side leaving a small edge of the background paper peeking out. Next add your 4" x6" photo overlapping the non-scalloped edge. 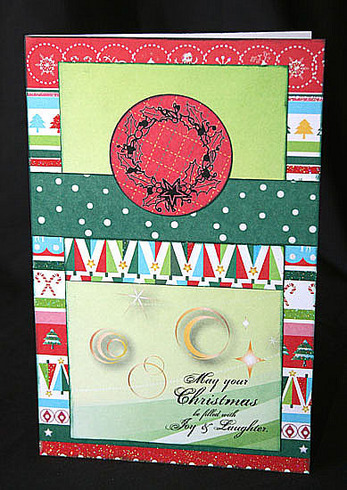 Add bling to the center of each scallop, a 3D Christmas present sticker and journaling. The 3D stickers are really easy to use. You peel the sticker off the sheet and place it where you want it. Press the sticky part down and fold and bend the sticker for the 3D parts to stand up. You will be able to see where you are to fold them. First I cut my 4"x6" photo down to a 4 1/4" x 4" size. 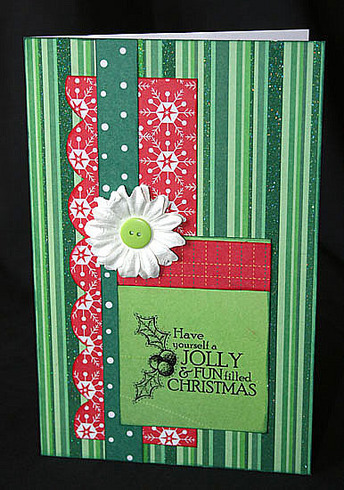 Then I cut a 4 1/4" x 3" peice from the Green Christmas Stripes Glitter paper. Next I cut a 4" x 6" piece from the Little Ornaments Glitter paper. I glued all of them down starting with the little ornaments paper, next the green stripes paper and then the photo. My photo shows you have I placed my design. Then I added a Christmas tree rub-on from the Trim The Tree package. Also from the Trim The Tree rub-on package I cut off the Love, Peace, Joy saying, a couple of mini presents and some stars to add to this page. Start by cutting your two paper pieces. 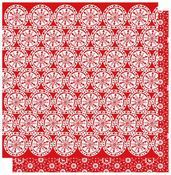 You need a 4 1/4" x 3" piece from the Snowflake Circle Glitter paper and a 4" x 2" piece from the Christmas Tree Glitter paper. I also used a 4" x 6" photo on this page. After cutting the papers I started with the snowflake circle paper and glued it down. The photo below shows the snowflake circle paper glued down. Next glue down the Christmas tree paper and your photo following the guidelines from the papers on the backside. 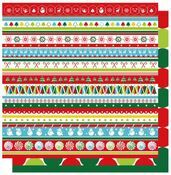 I added a 3D candycane and bow sticker next, then a strip of green gems. Of course the rub-on part is already done for you on this page. 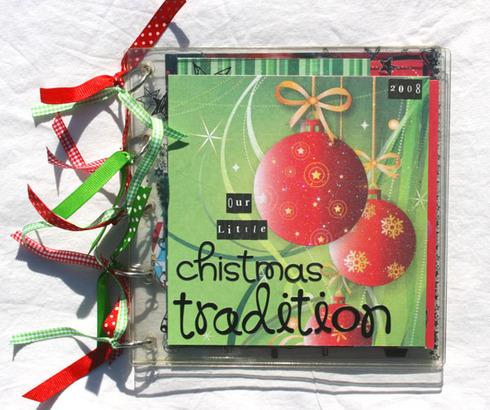 On this page I used a 4" x 5" photo and cut a 4" x 6" piece from the Christmas Icon Stripes Glitter paper. Then I cut e 5" x 4" piece of the Green Christmas Stripes paper. 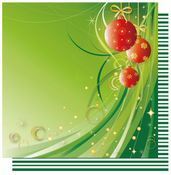 Glue down the Christmas Icon Stripes paper down first, then using the backside of the green stripes paper, glue it dot side up. Finally glue down your photo. The rub-ons I used for this step are from the Season's Greetings package. I added the star border along the right edge (you will have alittle of this border left and we will use it on page 6), some misc. stars on the top left corner and another rub-on across the green dot paper. To finish this page I added three 3D stars and a strip of red pearls. This is what page 5 will look like before you start. 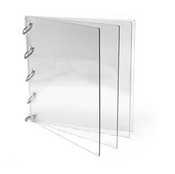 You will need a 5" x 4" photo on this page. 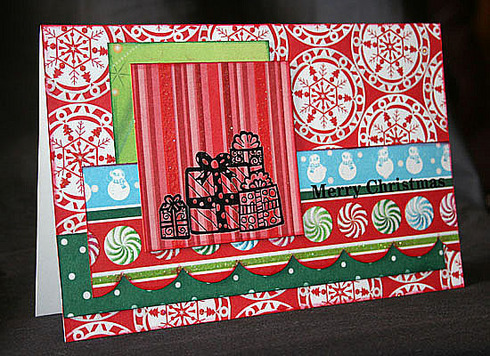 Cut a 4" x 6" piece of the Merry Wishes paper and a 3" x 3" piece of the Red Christmas Stripes paper. 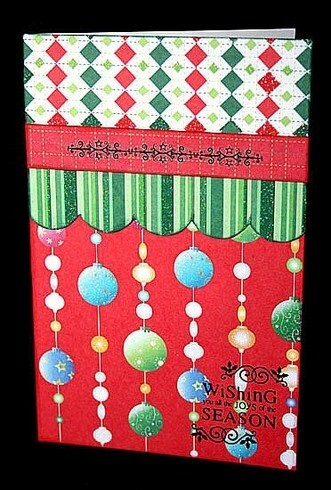 Start by glueing down the 4" 6" piece of the Merry Wishes paper, it will go on top of the dot paper showing through. Then glue down the red stripes paper lining it up with the backside of the photo. 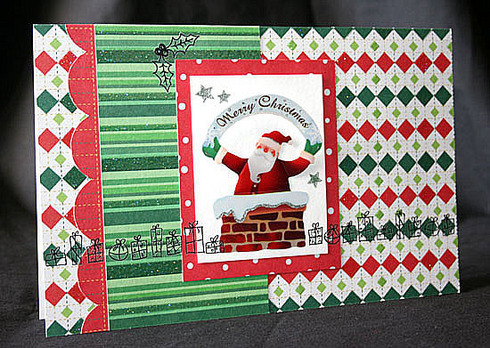 Your photo will then be glued down matching the edges with the backside of the green stripes paper. Next I added a 3D Santa sticker and a couple 3D present stickers, folding the edges so that they stand out from the page. My last touch to this page is the four little pearls that I added to the background paper along the left edge of my photo. All you need to start page 6 is a 4" x 6" photo and a 3" circle of the Christmas Tree Stars Glitter paper. I used my circle punch for my circle but you can also trace one if you don't have a 3" punch. I placed my photo in the top right corner. Before I glued my photo down I tucked my circle under the bottom left corner. Then I glued them both down. For the rub-ons I used some from both the Season's Greetings and the Trim the Tree packages. I used a cute corner rub-on directly on my photo. The season's greetings saying went on the circle with the leftover star border placed to the left of the photo. Then I grouped three tree rub-ons in the empty space at the bottom. To decorate my tree rub-ons I used some pretty Basic Grey Pearls and KaiserCraft Pearls. This page is so easy to finish all you need is a 4" x 6" photo and another 3" circle. I used the Christmas Icon Stripes paper to punch out my circle. Now all you have to do is line up your circle and photo with the ones on the backside and glue them down. 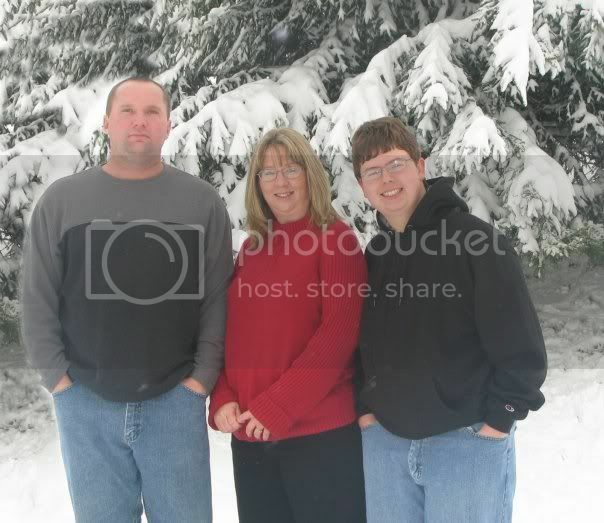 Make sure you glue down the circle before your photo. 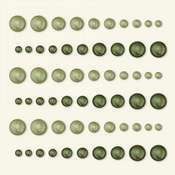 Now all that is left is to put your album together with the five rings that came with the album. Cut ten 7" long strips of ribbon and tie two ribbons to each of the five rings. You can use any ribbons that you already have. All of the ribbons I used are just some from my ribbon jars. For an added bonus with all of my leftover paper I started on my Christmas cards! Here's 6 cards that I was able to make with my scraps. I agree - gorgeous album and I just love your cards!!! Wow - great album and Gorgeous cards!! !